the practice in registries worldwide 7,8. Rosemont, Ill. – March 14, 2017 – The American Joint Replacement Registry (AJRR), the National Registry for the collection of hip and knee replacement data, has reached the one millionth hip and knee procedure milestone. This increased volume of data will lead to a more comprehensive look at joint replacement surgeries in America, and will aid hospital staff and patients in making better health care decisions. 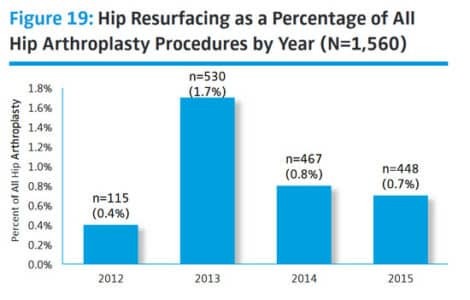 Note by Patricia Walter: This information is only for hip resurfacing in Australia. Many experienced hip resurfacing surgeons have personal series of HR which are more positive than the results below. This report is based on the analysis of 224,390 primary and revision hip replacements received by the Registry with a procedure date up to and including 31st December 2008. This is an additional 32,717 hip procedures compared to the Annual Report released in 2008. In this category of hip replacement there are 147,422 conventional total hip replacements representing 92.3% of all hip replacements and 12,093 total resurfacing hip replacements representing 7.6% of all hip replacements. for patients 65 years or older. There have been 14,901 total resurfacing procedures reported to the Registry, an additional 603 procedures, compared to the last report. The use of resurfacing hip replacement in Australia continues to decline. The number of procedures reported in 2011 was 39.7% less than in 2010 and 68.5% less compared to the peak in 2005. Osteoarthritis is the principal diagnosis for total resurfacing hip replacement (95.0%), followed by developmental dysplasia (2.5%) and osteonecrosis (1.7%).